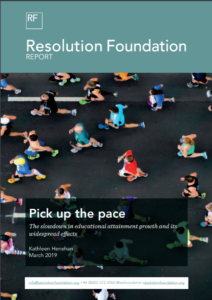 The Resolution Foundation released a new report on 19th March 2019 by Kathleen Henlan. This paper uses the Brexit moment to take stock of where Britain has got to on educational attainment, and where we might be heading. It highlights that while improvements to the country’s human capital stock have been driven by increasingly educated cohorts of young people flowing into the labour market, the pace of growth in young people’s educational attainment has more than halved since the start of the 21st century. This ‘slowdown’ is worrying because the qualifications held by young people flowing into the labour market play the predominant role in raising the country’s overall stock of human capital, a major driver of progress on productivity and living standards. “The UK’s exit from the European Union has ignited a debate on its skills opportunities and challenges, making now a good time to take stock. – because young people are those within closest reach of policy. For these reasons, they form a central focus of this report.